This time a Neuroptera species for a great lover of this group - Inanc (litoriachloris). 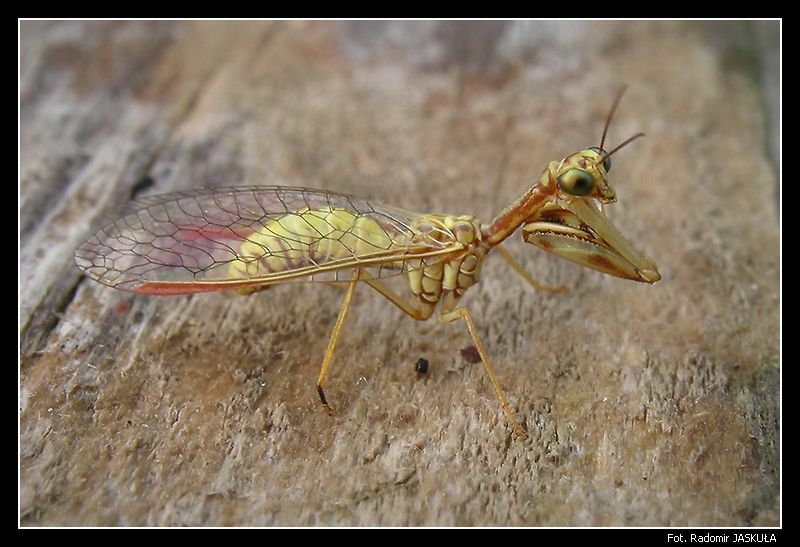 This is Mantispa aphavexelte U. Asp�ck et H. Asp�ck, 1994 (Neuroptera: Mantispidae) - one of the only five members of this family known from Europe. In Europe only two genera belonging to Mantispidae are known: Mantispa with 4 species and Nampista with 1 species only. What we can say about Mantispidae? This is rather strange group of Neuroptera. For the first view these species looks like normal and well known green lacewings (Chrysopidae) but except the first pair of legs. And this is the most characteristic morphological feature for this family of Neuroptera. The first pair of legs are very similar to legs of mantids and as in case of mantids they are used by these small predatory insects for hunting. As we can easy guess the Latin name Mantispidae was given to this insect group after similarity to Mantis = mantid species. These insects are rather termophilous and in Europe can be found mainly in S part of continent. As adults they are hunting for different small insects like aphids and flies. I like so much all the details got, the transparency of the wings, and the excellent pose of the upper legs. DOF creates an excellent effect with the short focus in range on the wood. A very good picture of this particular insect. What a peculiar insect, you must have been thrilled to find it! There must be more exciting insects still to be discovered in that part of Europe. Excellent close-up illustration showing fine sharp details. Nicely framed too. Great shot, very good POV and pose. Sharpness,details and colors are very nice. Wonderful close up.POV,details,sharpness,lighting,framing and composition are excellent.Have a great weekend! superbe image macro, vraiment tr�s tr�s r�ussi. Bon pov qui donne beaucoup de d�tails, belle gestion de la lumi�re et du contraste, pas facile sur ce sujet clair. Excellent photo of this species. This spring I will spend a lot of time in meadows to see this beauty. Last times I�m interesting more and more in insect�s world and always surprise me the incredible shapes and life style of them, but this is truly amazing and unthinkble to me. A neuropter that seems a mantid!!!! Very good macro, note, and photographic document. Fine capture of a Mantispa, an unusual and impressive insect on TN. The sharpness gives it a prominence against the BG and you have captured an excellent pose. Wonderful picture of this Mantispida. Excellent shot, taken from an unusual point of view, with lots of interesting details like eyes or wings. I think that Neuropteras are of the most beautiful insects we have in Europe. This is truly an exotic creature, Radomir. It looks like a cross between a lacewing and a mantis. The image is quite sharp and clear. You have captured a remarkable close-up image with incredible detail. Im'm particularly impressed by the wings and the color. Well not really, but i always wanted to learn more and photograph something like this. This is another splendid picture from you! The details across the entire body of this neoptera are razor-sharp and the colors are lovely. The contrast between the Mantispa and the BG behing it is great and the composition is very nice. PS: congratulation for the premiere!!! a good capture with nice colours and fine sharpness. Esse louva-a-deus � muito diferente do que o encontrado aqui na minha regi�o. A nitidez est� �tima. Obrigado por compartilhar essa bela imagem. Great macro Radomir of this tiny specimen... here in Argentina I captured a picture of very similar species. I like it a lot: composition, POV, DOF, focus, sharpness, colors, lighting, background, framing and notes. Very good presentation of this recent species with great complement of your note. Nadrabiam zaleglosci :-) Fotka ma bardzo ladne kolory i swiatlo choc mam wrazenie ze cos jest nie do konca tak z ostroscia. Moze to efekt kompresji w jpg!? Bardzo podoba mi sie to ujecie i technicznie- jest nieprzeostrzone i widac szczegoly, i artystycznie- zlapales u modelki piekny usmiech. Wow, what an amazing creature!! You show us one of wonderful insects in micro-world. Nice captured with excellent details and POV, DOF are also great! Great picture of this lacewings. Great sharpness, position, color and background. I've almost missed this picture somehow. Just stunning, that's what I'd like to say! Excellent photo of this fairy like mantis, this is truly flawless photo, and a very beautiful one, thanks for the note! excellent presentation of a unique creature. A perfectly well chosen point of view to show its strange shapes in fine details within maximum available depth of field from a very close distance. At least one member of that strange genus may be met near Vienna. I remember how surprised I was when such a Mantispa fly landed somewhere near me, noticing the striking similarity to a mantis while much smaller in size. Now, looking at your excellent close-up I witness the same kind of surprise when seeing the amount of similarities between those two members of totally different orders. Not only the front legs look exactly the same, but also the shape of the head. Thanks for sharing this document coming with excellent explaining notes. Due to a heavily increased workload at my job I have not been in at TN very often during the last months. So I enjoy it twice to discover that presentation. A strange looking insect. Very well captured with excellent details and composition. Thanks a lot for sharing.